When the summer months finish and the crisp, cool air of fall begins to arrive, one thing is certain: apple picking season is finally upon us. Apple picking is one of the oldest and simplest of American pastimes, but it’s still one of the most popular, especially in the state of New York. Apples are official state fruit of NY and there are countless great orchards and farms to find all around the state, offering dozens of different varieties from Golden Delicious and Empire to McIntosh, Braeburn, and countless others. Apple picking is a really fun way to spend some time outdoors in fall. Even though the air is a little cooler than it was in the summer, the months of September, October, and November can still be a super time to head outside and wander up and down the endless acres of beautiful NY orchards. Many farms in the state offer U-Pick services for very low prices, letting you fill up bags and buckets of apples to be used in all kinds of recipes, from tarts and pies to jams, chutneys, sauces, ciders, and more. If you’re hoping to do some apple picking in NY, you have a lot of different locations to choose from. 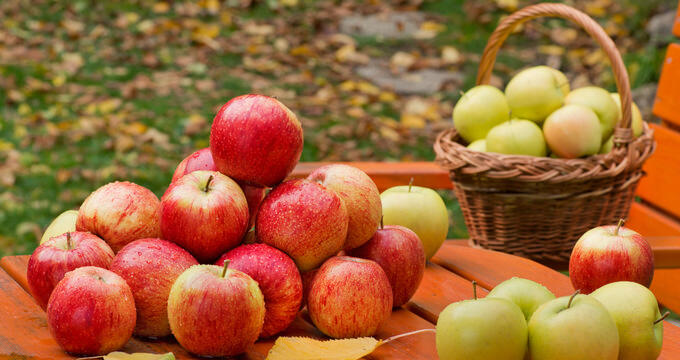 New York is blessed with an abundance of apple picking orchards, many of which offer additional activities and services like farm stores, hayrides, corn mazes, and more. Read on for some important details and overviews of the very best apple picking locations in NY. Just a little drive away from Rochester, G and S Orchards is an extensive and beautiful fruit and veg farm covering around 150 acres in total. The titular ‘G and S’ are Gary and Stephanie, the farm-loving duo that has been running this orchard for over thirty years. U-Pick services have been offered at G and S for around 25 years in total, with a lot of different kinds of produce available to be picked throughout the year, including more than a dozen different kinds of apples like Red Delicious, Royal Empire, Fuji, and Granny Smith. It might have the word ‘Pumpkin’ in its name, but Hank's Pumpkintown is also a fantastic apple picking location, and it’s very conveniently located for anyone in and around New York City itself. This orchard can be found on Long Island and is open every day through the fall months, offering lots of fun activities and special events for visitors of all ages to enjoy. Face painting, gemstone digs, corn mazes, hayrides, and more can be enjoyed at this NY apple picking spot. With eleven different apple varieties to choose from, including Empire, Fuji, Gala, and Golden Delicious, Apple Dave's Orchards is one of the most popular apple picking orchards in all of New York State and is nicely located among the beautiful scenery of Warwick. Live music and kids' activities can also be enjoyed at this location, along with freshly made apple donuts and other delicious treats. Apple Dave's offers fully free parking and admission and has been family-owned and run since 1949. Another popular NY apple picking spot, Wilkens Fruit & Fir Farm grows more than ten different kinds of apples, all waiting to be picked and eaten fresh or used in all sorts of recipes. If you’re hoping to find a nice array of different apples, this is a super location to choose and it’s open for U-Pick from the early days of September right through to the start of December. All visitors can use picking equipment and bags that are handed out on-site, and the friendly staff will even drive you over to the orchards as part of the entry fee. One of the top-rated apple picking sites in NY, Masker Orchards has been offering apple picking for over a century now, making it one of the oldest and most experienced apple picking locations in the state. With over 200 acres of apple orchards to walk around and enjoy, Masker Orchards is a super spot for all the family. Apple picking season at this location runs from September through to November.